PACC foster mom takes on some of the animal shelter’s neediest feline cases. You wouldn’t guess it from the eight grown cats she calls her own and the 26 kittens she was fostering at one point this fall, but Christina Aronson didn’t grow up with pets. 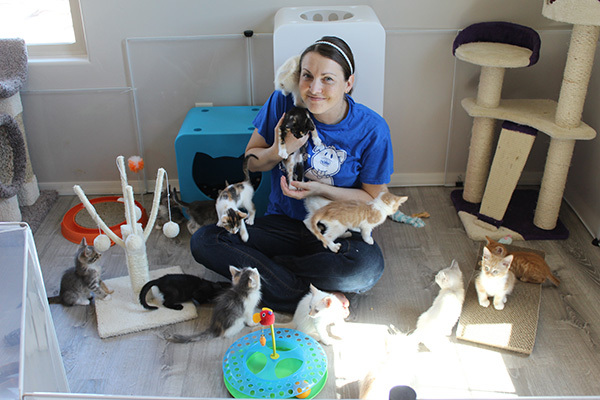 “I wasn’t really a cat person until I moved here from Ohio,” said Aronson, grinning sheepishly as she looks around the designated foster kitten room in her house. The room is sectioned off into different areas based on kittens’ medical needs. Aronson and her husband had new flooring put into after one too many accidents on the carpet. 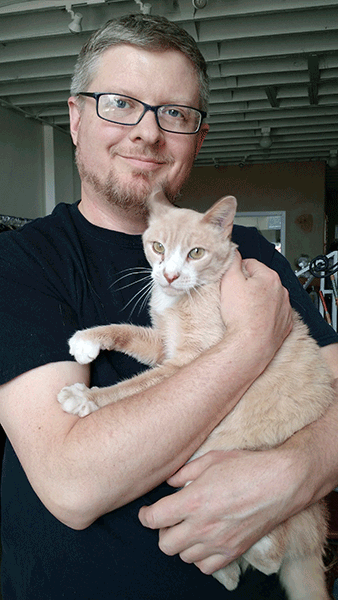 Aronson started fostering medically challenged kittens from the Pima Animal Care Center four years ago, when PACC had to start putting the kittens on deadline and reached out to the community for help. These days, she’s up between 4 and 4:30 every morning to feed all of the kittens with which she shares her home. And to give everyone their medication, whether they’re suffering from ringworm, panleukopenia, calicivirus, broken limbs or anything else. 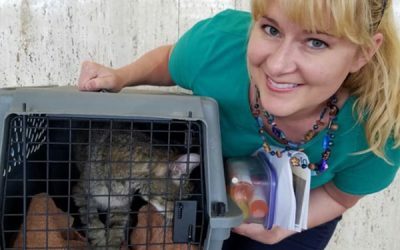 She started off taking in kittens with ringworm because other volunteers were reluctant to work with kittens carrying the highly contagious fungal infection. Aronson has actually caught ringworm from foster kittens before, but she resolved it quickly and continued caring for her charges. All eight of her own cats are rescues as well—seven from PACC and one from the Humane Society. There’s never a dull day in a house so alive with cats—most are kittens, she says, but there is an occasional adult cat. 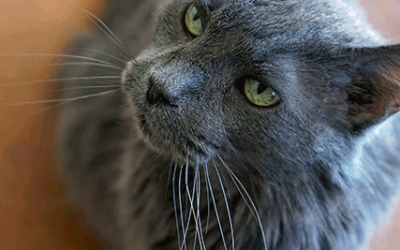 Sometimes, a case that the shelter had confidence would be an easy foster won’t make it. Other times, a charge Aronson takes on in hopes of making its last days comfortable will make a shocking recovery. These moments— offering companionship and comfort during an animal’s last days, or when an animal offers her a ray of hope in return— bring Aronson so much joy. An orange kitten in the corner is a reminder of both the ups and downs of the journey. Aronson took in both the kitten (originally called Joshua, and changed to Jacqueline once shelter staff realized she was a girl) and her brother after they were rescued from a hoarding case. They were about three weeks old. The kittens only weighed about 4 ounces. When Jacqueline’s brother got sick late one night, after the shelter had already closed, Aronson rushed him to the emergency vet, where he had to be put down. While they were there, Jacqueline tested positive for panleukopenia and started taking medication for it. Then she got a UTI. Then she got a tapeworm. Now she’s frolicking in the kitten room with her foster brothers and sisters, 14 weeks old and healthy. Aronson is most in her element when she’s helping cases like this. Aronson fits all of this around her job in the crime lab at the Tucson Police Department. She’s at the shelter every Monday helping to bathe and administer medication to kittens with ringworm, every Tuesday to drop off cats who need to be spayed or neutered, and every Saturday for the shelter’s vaccination clinic. She also stops in whenever she’s needed on other days, which is often—her husband Brian says, half-jokingly, that there’s always an emergency with a kitten. “She has helped other foster parents with kittens when they have complications, and because of her, a lot of kittens have survived and been adopted out,” said Cynthia Franco, the adult cat foster coordinator at PACC. Aronson says fostering is something that’s worth considering for everyone—after all, she hadn’t even spent much time around animals when she started volunteering at PACC, and now she’s an old pro. The shelter staff, the orientations and training held for new fosters, a supportive network of other volunteers and foster parents, and the option of what kind of animal to foster—adult or young, dog or cat—make the process less difficult than it might seem. As she looks at her sole adult foster—at least for the moment—who is recovering from calicivirus and a recent eye surgery, and bounding happily around the room, she smiles.